Beverley Moore has spent much of her life helping complete strangers through tough times, and she knows what it’s like to have others stand by her through her own struggles. Source: The Catholic Leader. The St Vincent de Paul Society recently honoured Mrs Moore with a special presentation for her 50 years of service to the organisation in various parts of Queensland. Her husband, Brian, a former state president of Vinnies, was by her side when members paid tribute to his wife during the presentation at Killarney, in the Southern Downs. For Mrs Moore, it all started at Dirranbandi, in outback southern Queensland, when she followed her husband into the Vinnies fold. That woman and the friends she made through the St Vincent de Paul Society were the ones who stood by her and Mr Moore when crisis struck. The youngest of their five sons, Russell who was then aged five, became seriously ill.
“One lung had collapsed on one side and the fluid was pushing the heart and would’ve collapsed the other lung,” Mr Moore said. “It was a good job we did (take him to Brisbane) – we would’ve lost Russell earlier, but we didn’t lose him in the finish, because it was divine intervention that he’s still alive,” he said. Vinnies friends were there again when Beverley had a battle with breast cancer a few years ago. 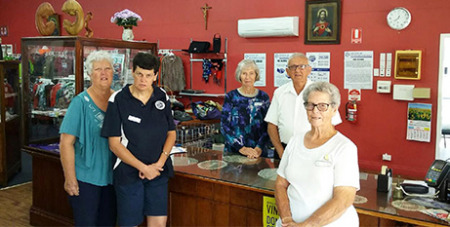 She was co-ordinator of the volunteers at the Killarney Vinnies store at the time, and rallied around her in support.